Is Germany’s AfD Party Self-Destructing? Not yet, but they are working on it. In my research paper on the AfD party’s 2014 EP manifesto, I argue that the AfD will have to face a choice between their current mix of social conservatism/economic liberalism on the one hand and right-wing populism proper on the other. That time is now, and the choice seems to tear apart the party. Since its inception in early 2013, the AfD has rolled out six campaigns at the federal and state level. It is arguably the most successful new party in Germany since the Greens, but the media coverage of the last three weeks has been nothing but devastating. A month ago, the AfD leadership in Thuringia published the “Erfurt Resolution”, which is effectively canvassing for a more rightist profile of the party. The “liberal” wing launched a counter manifesto, the “Germany Resolution”. As of today, “Erfurt” has 1,905 likes on Facebook and more than 1,600 signatories in the real world. “Germany” has 1,403 likes and an undisclosed number of signatories. While these number are low in absolute terms, the AfD has only between 20,000 and 25,000 members, and in most parties, only 10 per cent or less of the membership are actually active, so some 3,000 people taking a stand represent a very significant degree of polarisation. This polarisation has already split the parliamentary party in Thuringia: One of the AfD MPs (who is still a party member) had the whip removed from him, and two others may still suffer the same fate. 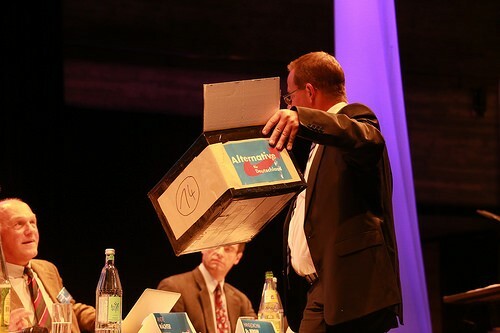 In Hesse, the state party has just voted out its leadership while I’m writing this, and might bring back its former leader, who had to resign five months ago because he had kept shtum about his previous membership in the right-wing extremist Republikaner party. In other news, Marcus Pretzell, who is party leader in NRW and one of the AfD’s MEPs, has been investigated by the party’s national exec following financial irregularities. The report recommends that Pretzell should keep his seat in Brussels but resign from the NRW leadership, because he was not able to deal with the demands of his private and political life. Unsurprisingly, Pretzell refused to step down, and threatened to disturb the upcoming election campaign in Bremen. At the federal level, the party’s HQ is in disarray. The party manager has resigned before he could be sacked, and the treasurer is chasing large sums of money that went missing in 2014. The current level of infighting is dramatic, and it is hurting the party. The Greek shenanigans and the current wave of unease about refugees and asylum seekers should help the AfD, but it is hovering at just about five per cent in the opinion polls. That does not bode well for the election in Bremen in May (where the right-wing extremist DVU has done well in the past). But it’s not the end of the road for the AfD yet. New parties tend to quarrel, because they attract all sorts of activist. The Greens are an interesting point of reference in this respect. They only became a disciplined party when they effectively ejected the leftist wing in the 1990s. The AfD’s national leadership is currently pondering the merits of a referendum by party members on the AfD’s future course. If such a referendum is held and results in a draw, the party might well split, otherwise, an exodus of the losing side and their political marginalisation is the most likely scenario.